Unless you’re vegetarian, how can you go to Buffalo and NOT eat Buffalo wings? 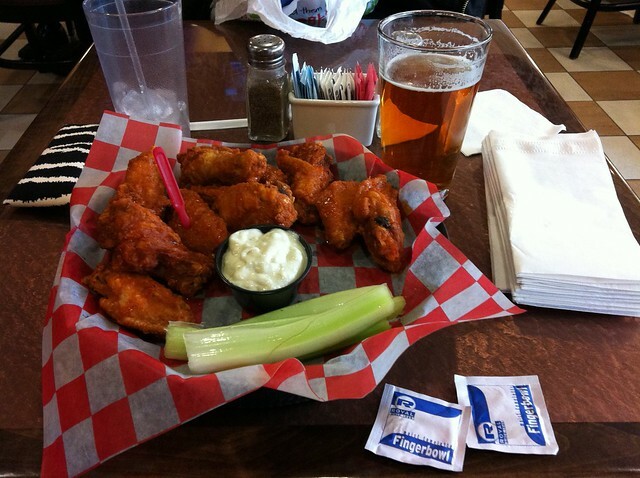 There’s two famous places to eat Buffalo wings in Buffalo: Duff’s and the Anchor Bar. Even if you don’t eat meat, both bars have some vegetarian snacks to eat, such as jalapeno balls and mozzarella sticks. My friend also recommends 911 Tavern for wings. Duff’s is generally the local favorite for where to eat Buffalo Wings in Buffalo as well as my personal favorite although getting out to Duff’s can be harder without a car. It’s possible via public transport. Anchor Bar claims to be the inventor of Buffalo wings and there’s something iconic about having Buffalo wings at the Anchor Bar in Buffalo. 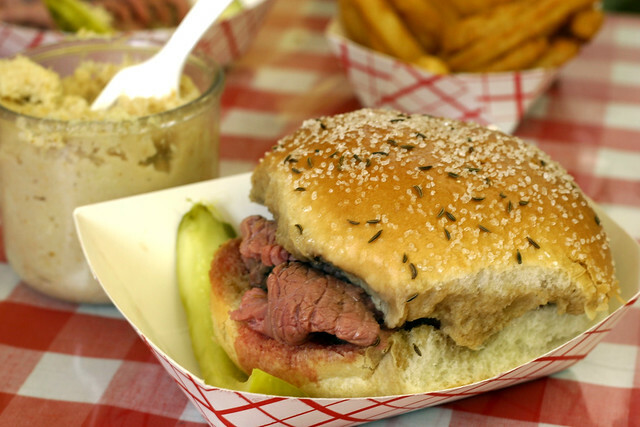 Beef on weck is a typical dish from Western New York that is said to be invented by a German immigrant to Buffalo in the mid-1800s. The kimmelweck roll is supposedly inspired by a bread baked as part of a special offering to the dead made with salt and caraway seeds. On the sandwich, you’ll find thin-cut beef cooked to perfection and horseradish. It’s a unique and filling meal that is very salty. You can visit Charlie the Butcher for trying out beef on weck in Buffalo. You can also find it at Anderson’s (below). Ted’s is part of many childhood memories of many Buffalonians, including one of my closest friends. They’re famous for their charcoal grilled hot dogs that are crispy and delicious. The footlong is a challenge, but if you’re hungry, go for it. Their shakes and onion rings are tasty. My husband likes to joke that I could eat a sandwich for every meal for the rest of my life. He’s correct if it’s from Dibella’s and you’re likely to feel the same after having an old-fashioned sub at Dibella’s. You might think you know submarine sandwiches, but Subway is a joke compared to the real thing. Dibella’s was founded by Italian immigrants in Rochester who were importing ingredients from Italy prior to getting into the sandwich making business. This family-run business prides itself on fresh bread made twice daily. I’m biased in saying that the everything bread is the best one, but it is. They have veggie options as well as meat options (the Godfather is delicious). Be sure to get Dibella’s Oil Dressing on it as well as hot peppers. My other favorite part of the meal is the gooey homemade chocolate chips that you’ll find near the cashier. I’m obsessed with the red velvet donuts at Paula’s. Even my husband, who doesn’t enjoy sweets, had to admit that they are really good. This local Buffalo institution has moved a couple times, however don’t be alarmed by one of its locations in an average looking strip mall. They run out of their donuts fairly quickly, so you should get there as early as possible. There’s a significant line in the morning and they often have a deal where you can get a coffee with your donut. I often get two, just in case I get hungry later. 😉 Paula’s has a couple locations around Buffalo. Bear with me here, but as a native New Yorker, I’m picky about my pizza. However, the style of pizza in Buffalo is a bit different with a thicker cut than my beloved NY pizza. You should call it “sheet pizza” due to its shape. I really like Bocce Club or La Nova (original location only) for their thick crust pizza with pepperoni although I still find it weird to have a large pizza in a square shape. I also like having Buffalo chicken on my pizza, which is a common request given that most pizza places in Buffalo do wings and pizza. The combination of the two is magical, so trust me on this. Parkside Candy is one of the most famous candy shops in Buffalo. This old-fashioned candy maker with a gorgeous vintage exterior has a really great variety of sweets and I love stopping in here for some candy. Most people only head to Pearl Street Brewery for the beer, but I really love Pearl Street’s affordable and tasty food. The atmosphere as well as affordable prices mean that you can sit for hours sipping on a beer as well as eating a really good meal. I recommend sticking to the original location downtown, rather than the second branch. This Western New York chain from Syracuse has some great barbeque. People don’t usually associate New York with barbeque, but Dinosaur Bar-B-Que is good proof that there is decent barbeque in the North too. ETS is a favorite of Buffalonians and perfect for anyone eating in Buffalo on a budget. Elmwood Tacos and Subs (usually called ETS) is located in the heart of Elmwood village and it’s a cult classic. Their subs are good and their tacos are Buffalo’s own take on tex-mex. It’s delicious and cheap. The fish taco is good, but it’s hard to go wrong here. Who doesn’t love Wegmans? This Western New York supermarket is still one of my favorite supermarkets, even after moving to Europe. Their local brand is just so delicious and the allergy-friendly buffet is part of the appeal. If you don’t have time to drive out to Dibella’s, be sure to pick up a sandwich and a chocolate chip cookie at Wegman’s. The beer selection is also fantastic. There’s a large restaurant area that gets crowded around lunch/dinner. Some branches are 24 hours, however the sandwich shop is only open during specific times. They have a really good philly cheese-steak on a hoagie. On a night out, you’re likely to see a massive line at Jim’s as their food is really satisfying after a night out. I personally love their chicken finger sub made with hot sauce. It can be greasy, but that’s part of the appeal. They have chains all over Buffalo, so you’ll find a Jim’s near you! You’re probably wondering what a garbage plate is. This Western New York classic, originally from Rochester, is a late night classic and the kind of food that you’ll need after a lot of really good craft beer in Buffalo. It was created by a Greek immigrant who who combined unsmoked sausage and potatoes. However, the garbage plate is far more than that. It’s usually a combination every food in the kitchen, including hamburgers, onions, mac salad, ketchup, mustard, sauce, and (sometimes) chicken fingers. It’s one of those dishes that you really hate or love and it’s best eaten after a night out. Try Greek To Me Restaurant in Tonawanda as my go-to place closed. This Buffalo classic, also close to UB, has those old-school ’50s vibes. Their milkshakes are why they’re famous. I can’t resist the Oreo milkshake. If you’re looking for a kitschy place to have a date, you need to come here prior to walking to Parkside Candy. Click for a downloadable map with all of these Buffalo food recommendations. Have you been to Buffalo? Any places to eat in Buffalo that I missed? Oh my goodness this all looks amaaaazing. It does look pretty spaced out though. I’ll remember if i ever go to Buffalo, I need to have a car! p.s. It’s waaay before lunch, but I am so hungry now! OK. Grew up in Buffalo, so I have opinions. Note that it’s been a few years since I was back but hopefully the good places are still around. Garbage plates are not something i encountered, ever. Upon learning what they are I don’t think I missed out. Greek diners. There’s one on every corner, and everyone has a favorite. You can get an omelet literally any time of day. Or souvlaki. Which, yes. The original Duff’s is the only one I recognize. This should go without saying, but blue cheese only on wings. NEVER ranch. And no one in Buffalo calls them Buffalo wings. They’re just wings. Chicken wings if ya nasty. Gravy fries at Duffs too. Natalie’s on Millersport (not far from Duff’s actually) looks like a hole in the wall but it rules. Get a megadera sandwich. Pano’s. Pano’s. Pano’s. Pano’s. Pano’s. Is the Buffalo Brew Pub still there? I loved that place. It was just off Transit, though I forget which street it was actually on. Pizza Plant is its own weird style of pizza but it’s good. I always liked pods. There was one in the Tony Walker plaza last time I was there. Also, is Tony Walker and his weird overpriced tee shirts still a thing? Thank you so much for reading and great to hear from a Buffalonian. Re: Garbage Plates…they’re unique. That’s mostly why I mentioned them, but you’re not missing too much. Re: Greek diners, YES. I love this about Buffalo. I’ll be sure to visit some of the others that I don’t know on my next trip. I’m fine with Buffalo pizza, but it’s been too long since I’ve had it! I used to love Pano’s, but it’s gotten quite expensive and quite a few of my friends don’t go there anymore as they told me that it’s not as good. I still go there sometimes as my dad really loves it, but I ended up going to another great Greek place on my last trip up to Buffalo along Elmwood. Yes, Buffalo Brew Pub is still here and doing well. I’ve gone many times and it’s a decent place to eat/drink. Their craft beer selection is really good! My friends and I go there to drink mostly, but occasionally lunch. I’ve been to pizza plant although I always loved La Nova to be honest. Yes, Tony Walker is still a thing. Thank you so much for reading and you definitely need to revisit Buffalo. Things are definitely changing/improving with so many new restaurants opening up! Why is Leonardi’s never mentioned when it comes to pizza? Spot on about ETS, best meat & cheese burritos without question.. I’m leaving Charlotte tomorrow morning going to BUF, bringing back Scimes sausage, ETS and a Leonardi’s..
Buffalo is home to the 20th best taco in America, and it’s not ETS. La Divina Mexican Store, is like a dive bar for tacos. Tiny, dingy, but I’ll be damned if I’m not there every week or two. The fact that isn’t on your list is astonishing.